Trendy and comfy! - Absolutely love love love this cute shoe. It made my size 9 foot look really small. I wore it all day and it was really comfortable. 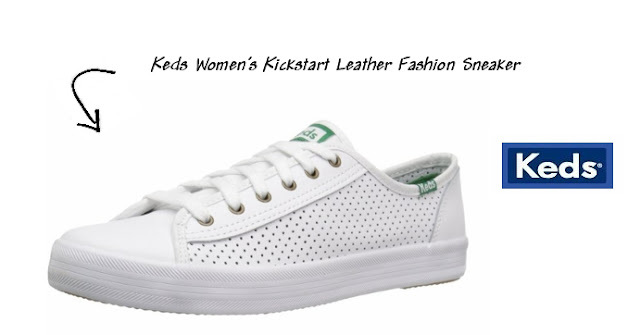 I love the look of a cute white sneaker and these Keds are just perfect. I receive these from amazon a few day ago and was looking for a clausal cute shoe for playing and travel. I love these. "Leisurely Saturday mornings have never looked so good". I wanted something to go with the "Girlfriend Jean look" and although not the exact shoes from the Chicos catalog, a close match. These are leather with a rubber sole and not the typical canvas Keds, as shown below. From the mid-1980's through the mid-1990's, Keds were very popular with girls from elementary school age through tween, teens, college age and beyond. Moms also wore this same trend as their daughters. These have been around as long as I can remember as a casual fashion shoe that can go with anything. Keds celebrated its centennial in 2016 and the continuation of its "Ladies First Since 1916" campaign. I love the slogan and the Keds web site is fun to browse. I got the shoes above from Amazon (size 9) for $41.00 - a real shoe bargain and cute. Enjoy!